Filed to: Can We Catch a Break?Filed to: Can We Catch a Break? 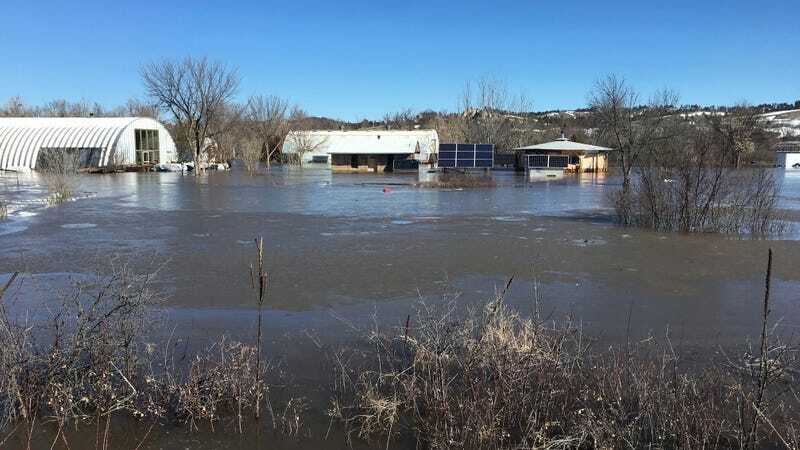 This is how flooding in March 2019 left one person’s property on the Pine Ridge Reservation. On Wednesday, a giant winter storm began to pummel the Midwest with what could be up to 2 feet of snow, and the Pine Ridge Reservation in South Dakota is in its path. The Oglala Sioux people make up the reservation’s nearly 40,000 residents—and they’re nowhere near ready for another disaster. Last month’s bomb cyclone devastated the reservation. It’s barely been a month since the last bomb cyclone hit the Midwest, and now the tribe must brace for similar conditions once again. Pine Ridge has barely begun to recover since last month, though. That weather event displaced some 1,500 residents and damaged more than 75 structures throughout the reservation. Most of those who were displaced have returned home, but the storm washed away culverts and roads, too. Some of those who returned home are now forced to walk a half mile from the nearest road, Iron Eyes said. Others have constructed new makeshift roads. However, this latest snowfall is expected to erase any preliminary road-building work that tribal leaders had begun throughout the reservation, said Iron Eyes. The tribe, along with the South Dakota Senate, has been calling on the federal government to declare the situation in South Dakota a federal disaster to provide it with immediate financial help. So far, though, the tribe has received no aid beyond a National Guard team the state sent to help distribute water in the days immediately after last month’s bomb cyclone. The tribal government anticipates the cost to repair roads, bridges, and other infrastructure will total than $100 million, potentially in the hundreds of millions. What the storm looks like via satellite. Really, though, this ongoing crisis began in July 2018 when the reservation was struck with a seriously devastating hail storm that caused up to $10 million worth of damage, Iron Eyes said. At the time, the tribe was able to receive only $450,000 from the Department of Housing and Urban Development to help cover the cost. The tribal government hasn’t been able to fully recover since—and these snow storms aren’t helping the situation. There’s still no research on the link between climate change and these specific events, but Iron Eyes doesn’t doubt its impact for a second. So far, this week’s storm hasn’t spurred any evacuations or disaster response on the ground, but the Oglala Sioux must be ready for anything. No one expected the March bomb cyclone to be as bad as it was, so tribal leaders aren’t letting their guard down. Right now, they’re asking the public to donate water, non-perishable foods, diapers, and hygiene products. And they’re monitoring the snowfall to respond as soon as the weather threatens the life of their residents. The Oglala Sioux weren’t always in need of help from the wider world. The once-nomadic tribe enjoyed plentiful buffalo and rich natural resources offered by the sacred Black Hills of the Great Plains. Today, the Oglala Sioux have little to show for their prosperous history; colonialism, broken treaties, and genocide took it all away from them. Instead, some of the worst poverty in the U.S. has replaced the wealth the Great Plains nation once had. This troubled history has left the Oglala Sioux in a precarious situation that is especially put to the test during natural disasters. It’s a situation that’s echoed across the country: from a lack of basic infrastructure like paved roads to their dependence on local natural resources, indigenous people are in a unique position when it comes to their vulnerability to extreme weather. But as Iron Eyes put it, “the Oglala people are strong.” White colonialism couldn’t conquer them before, and they’ll be damned if they let some snow do so now.